Racism is abhorrent. 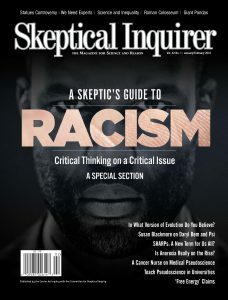 It is therefore easy for a movement such as skepticism to adopt anti-racism stances, but skepticism must avoid promoting viewpoints because they are politically popular or self-satisfying. What might work? Certainly being violent back won’t help — it will just egg the racists on. Jennifer Eberhardt’s research shows subconscious connections in people’s minds between black faces and crime, and how those links may pervert justice. Law enforcement officers across the country are taking note. The most serious implication is that Daryl Bem, a famous and well-respected psychologist, has been guilty of “an unethical manipulation of data in search of statistical significance” to support claims of the paranormal.